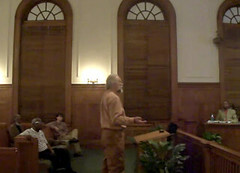 Here are videos of the February 2012 Industrial Authority meeting. Apologies for the poor sound. The room turned out to have very echoey acoustics, and no placement of the camera seemed to alleviate that. Also it's in three chunks, the first of them quite long. In the interests of moving along and catching up on posting videos of recent meetings, we're going to leave it like that for now. Here's the agenda. The only thing a board member said about it was Chairman Roy Copeland reminding me that the board didn't answer questions in Citizens Wishing to be Heard. Col. Ricketts added that in staff's discussions with CCA, CCA had indicated they were mulling it over internally, and VLCIA should "stand by" for CCA's next move. That's right, your local Industrial Authority, whose staff and land purchases are funded by your tax dollars, should stand by waiting for a private prison company to tell them what to do. And the Industrial Authority board's silence is an answer: they said nothing different from their previous vote for the contract to bring in this private prison; nothing different from their previous acceptance of the first and second option extensions; and nothing in objection to what Col. Ricketts said. Industrial Authority Executive Director Andrea Schruijer told me to expect their board to say something at their 2PM Thursday board meeting about the private prison Corrections Corporation of America (CCA) wants to build on US 84 at Perimeter Road. If they don't give CCA another extension, the contract expires March 13th. There's still time to contact them, (229) 259-9972. Or go to their board meeting at 101 North Ashley Street, 2PM Thursday February 23rd. You may recognize the wording from the petition. You can always write your own letter with your own reasons. 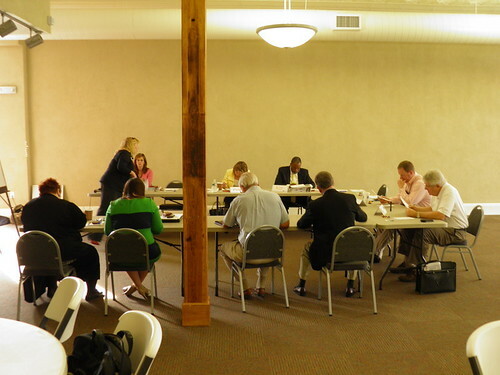 The Valdosta-Lowndes County Industrial Authority is having a retreat 9AM-2PM today. They have a facilitator, who is going through what looks like the usual facilitated procedures. She claims to be camera-shy, but Chairman Roy Copeland tells me he wants the Industrial Authority to be transparent and to be seen as transparent. Here the facilitator is getting the board and staff to answer some initial questions. Pictures and videos by John S. Quarterman for LAKE, the Lowndes Area Knowledge Exchange, 23 February 2012. We learned yesterday from Valdosta-Lowndes County Industrial Authority (VLCIA) Executive Director Andrea Schruijer that we can expect an opinion from the VLCIA board at tomorrow's 2PM board meeting about Project Excel, the CCA private prison whose contract expires March 13th unless VLCIA gives it a third extension, which they haven't so far. It's not too late to express your opinion to this tax-funded (1 mil of your property taxes + SPLOST funds, for around $3 million a year) appointed board. Follow this link for contact information for the VLCIA board. Or sign the petition online and your signature gets emailed directly to VLCIA Executive Director Andrea Schruijer. Thursday's Industrial Authority retreat and board meeting are both open meetings, which the public can attend. And at the 2PM board meeting apparently there will be news about Project Excel, CCA's private prison. VLCIA Executive Director Andrea Schruijer clarified on the telephone just now that Thursday's 9AM-2PM board retreat is an open meeting; the public can attend. She said the agenda was made by the facilitator, and she had not seen it. The purpose of the retreat is for board members to talk about their experiences and roles as board members. The retreat is not for discussing specific projects. Regarding the 2PM board meeting Thursday, she said she thought the agenda was on VLCIA's web pages. When we looked and found it wasn't there, she said apparently there was some confusion due to the rescheduling of the meeting, and the agenda would be there soon.